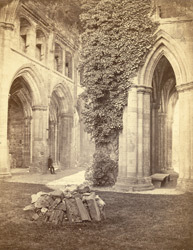 "The nave of this Abbey was at one time fitted up for the parish church, so that some of the masonry used for that purpose is still to be seen; but being now partly cleared of such work, much of the ornamental wall, with windows and tombs, is visible. Many altars, basins for holy water, and other remains of separate chapels, appear in the aisles, among which are those of St. Mary and St. Waldave. Several of these chapels have been used as burying-places, and many interesting and curious inscriptions are still to be seen. In fact, the whole building is so elaborately ornamented, that at every step some new beauty appears; and it has been well observed, that Melrose Abbey contains the richest variety of Gothic ornaments to be found in the island."